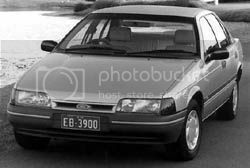 The EB Ford Falcon along with the NC Fairlane/ DC LTD was introduced in July 1991, as a minor facelift of the 1988 EA. Series I- July '91-April '92. Series II- April '92-August '93 (NC/DC II May '92-March 1995). 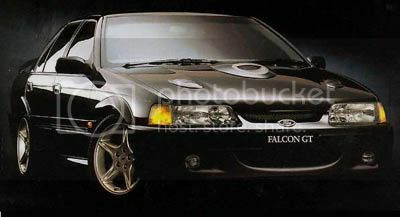 Falcon* - from $24,042. Fairlane* - from $38,489. LTD* - from $54,315. 36,374 EBs, 84,847 EB Series IIs, 3,420 NCs, 10,789 NC Series IIs, 431 DCs, and 1,450 DC Series IIs were built. EB replaced in August 1993 by the ED Falcon. NC/DC replaced by the NF/DF in March 1995. The EB Falcon, along with the VP Holden Commodore, heralded the start of the new V8 Supercar series, with the guidelines suggesting Australian-made cars with 5.0L pushrod V8 engines, and rear wheel drive. 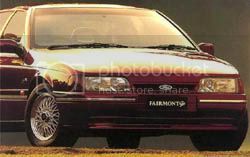 The EB Falcon won the first V8 Supercar title in 1993, under #30 Glenn Seton, in his Peter Jackson Racing Falcon.